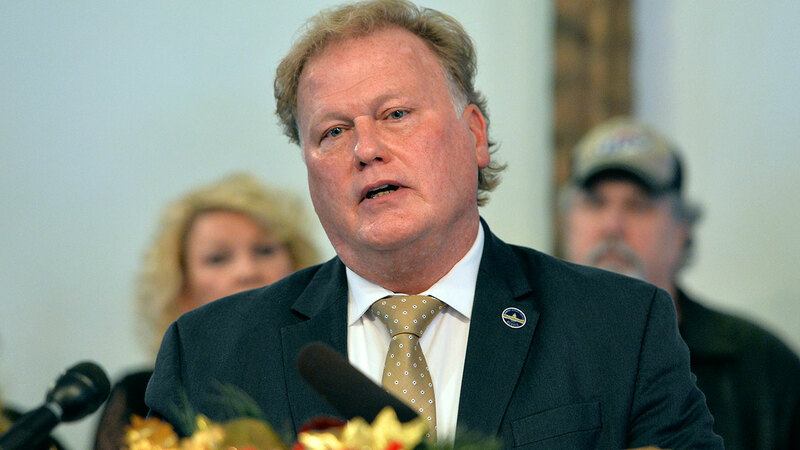 FRANKFORT, Ky. -- Dan Johnson, a Republican state lawmaker in Kentucky who defiantly denied allegations that he sexually assaulted a teenage girl in the basement of his home, died in an apparent suicide Wednesday night, the county coroner said. He was 57. Bullitt County Coroner Dave Billings said Johnson died of a single gunshot wound on Greenwell Ford Road in Mount Washington, Kentucky. Billings said Johnson stopped his car at the end of a bridge in a secluded area, then got out and walked to the front of the car. He said an autopsy is scheduled for Thursday morning. Johnson was elected to the state legislature in 2016, part of a wave of Republican victories that gave the GOP control of the Kentucky House of Representatives for the first time in nearly 100 years. He won his election despite Republican leaders urging him to drop out of the race after local media reported on some of his Facebook posts comparing Barack and Michelle Obama to monkeys. The pastor of Heart of Fire church in Louisville, Johnson sponsored a number of bills having to do with religious liberty and teaching the Bible in public schools. But he was mostly out of the spotlight until Monday, when the Kentucky Center for Investigative Reporting published an account from a woman saying Johnson sexually assaulted her in the basement of his home in 2013. On Tuesday, Johnson held a news conference in the pulpit of his church, which he began by leading friends and family in singing a portion of the Christmas carol "O Come All Ye Faithful." He said the allegations against him were "totally false" and said they were part of a nationwide strategy of defeating conservative Republicans. He referenced Republican Alabama U.S. Senate candidate Roy Moore, who faces accusations of sexual misconduct from multiple women. The sexual assault accusations against Johnson were revealed as a sexual harassment scandal involving four other Republican lawmakers was unfolding at the state Capitol. Former Republican House Speaker Jeff Hoover resigned his leadership position after acknowledging he secretly settled a sexual harassment claim with a member of his staff. Three other lawmakers were involved in the settlement, and all lost their committee chairmanships.